Hello lovely foodies! Today is a very auspicious day for many religions in India. Gudi Pawda, Cheti Chand, ugadi – all fall today. So, I want to share a very special recipe today to celebrate this day. 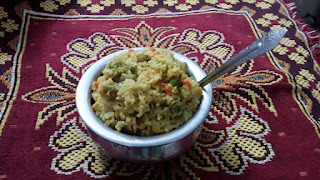 Bhuni Khichdi is an authentic dish of West Bengal. 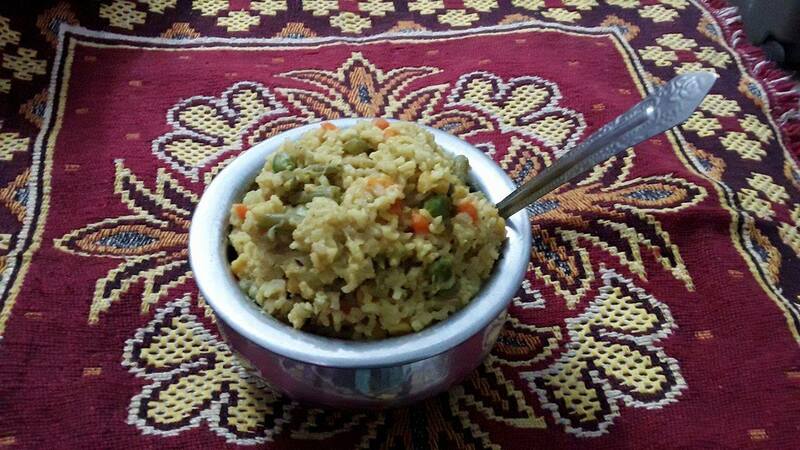 Mostly in religious occasions, this khichdi is made to offer the deities. Toast the moong dal, wash and keep aside. Heat the oil in a deep pan and when hot, add the bay leaf and garm mashala and fry on a medium flame for a few seconds. Add cauliflower, carrot, beans, ginger paste, turmeric powder and salt. Mix well and fry on a medium flame for 1 to 2 minutes. Add the drained rice, moong dal and mix well. Cook for 3 whistles. Now, add 3 cups of water, cover the pan and cook in low flame. Off the flame when the rice and dal well cooked. Add the Ghee and mix well. Cover it for 5 minutes, and then serve.